The Ten Commandments Part VIII: 666, the Most Feared Number? The people, “ET H’AM“, that G-d refers to has the numerical value of 516, which we know from chazal is the number of times Moses needed to pray if he wished to enter the Land of Israel and bring the final redemption, but G-d had instructed Moses to stop at 515. And as we’ve previous written, according to the Arizal these coincide with the 516 hours between Rosh Hashanna and Hoshanna Rabba. Then 4 verses later, after Moses pleaded on their behalf, the 4 Hebrew word phrase, “God refrained from doing that evil,” has a gematria of 516 as well when the kolel of 4 is subtracted. The connection between them is that G-d put off that decree to destroy the people in the same way that he put off the final redemption h’geula for 66.6 jubilees years. 2448 + 3330 = 5778. But as all judgments, they can be meted out with harshness or mercy. In this case, it was mercy. 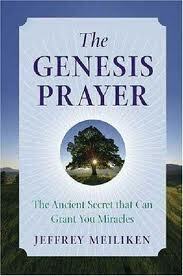 With the generation of Noach, it was harshness for as chazal explain, Noach didn’t pray for the people as Moses had. The lesson here is that mercy comes when we pray for others. There are 6666 letter Bets(B) in the Torah up to that point, reminiscent of the value 66666.308 x 26, which as previously stated was the total gematria of the 22,000 letters in this full 5 portion section. One way to interpret this is that at the 6’s He stopped working on us, and withdrew to spiritual, for in the very next paragraph, the Israelites at the urging and persuasion of the erev rav decide they couldn’t wait another 6 hours, and in 6 verses they made the golden calf instead. It appears they stopped working on themselves first. So is it surprising that the numerical value of the biblical “golden calf” is 108, which is 18 x 6, or chai x 6, meaing giving “life” to the 6. It’s also (6+6+6) x 6. And 108 as 1 more than 107, which we know indicates the year 5778 (2018 CE), makes the statement that the erev rav (the people) need to wait 1 period beyond 5778, they need to atone for the 6 hours and 6 verses; they’ll need to wait until the 6th millennium, the year 6000, 222 years more. But beware, knowing that, they will probably do everything they can to prevent everyone else from achieving the Tree-of-life reality in 5778, just as they did 66.6 jubilee years earlier. The word “spiritual (vyinafash, VYNGSh)” has the same gematria, 446, as mot, death. This double meaning is similar to Moshiach and Snake, in that when we’re not working (on ourselves) it can be like and thus can lead to death, or if we chose otherwise, it can lead to connectivity to the spiritual realm, where our physical down-time is a spiritual time (not a dead rest time), a time to work on ourselves spiritually and thus recharge our physical world for the coming 7 day cycle. This dichotomy on a grander scale is indicating that the 66.6 jubilee (Biblical 50 year period) will lead either to death (a permanent end) or to the spiritual realm (the tree-of-life reality) in the 7th period, and this time frame is hinted at by the 5761 letter Nuns(N), each of numerical value 50, through this same location in the Torah, as in the year 2001 CE, when it appears the period of Oy and Ashrei began (at least physically) with 9/11. Spiritually it began in 5760 as Rav Abraham Azulai suggested it would, 18 (6+6+6) years before 5778. 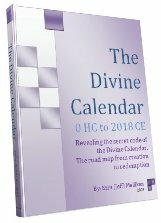 As we will explain very soon in the upcoming articles in Ten Commandment series the year 2001 CE was indeed marked by the Ten Commandments themselves as the beginning, and the 18-year period was laid out for us. If we consider chazal’s analysis that after 6 millenniums, the geula will happen in the 7th, then we have to look at the millenniums as elefs (thousands) each of which has the numerical word value of 111, and thus the 6 of them total 666. Thus 66.6 equals 6 millenniums. And just to hammer home the point, up until chapter 32 and the 6 verses of the golden calf there are 5777 letter nun’s of value 50, and thus symbolically and spiritually related to the 50-year jubilee period. As the Zohar explains, the thousands are found in YHVH, and jubilee is Binah. 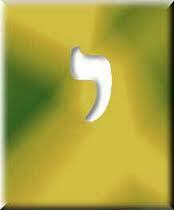 And the aspect of the YHVH that corresponds to Binah is Sag (YVD HY VEV HY). The 3 Yuds (YYY) at this level each have a value of 10 and when multiplied together form 10 x 10 x10 =1000. And since there are 600,000 component letters in the Torah, the 5 component and composite yuds in YHVH similarly form 10 x 10 x 10 x 10 x 10 = 100,000. 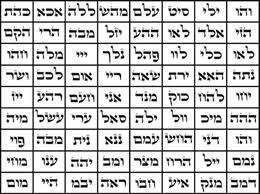 To understand this you must see the two letters Hey (H) as their component dalet-yud’s 2 x (DY) and combine them with the letters vav (VV) to form yud (YVD) and yud (YVD). You then add the Yud (Y) of YHVH and the two component yuds (Y) from the Heys, and you get the 5 total yuds in the YHVH at the level of Malchut (Ban), which is the level that the 600,000 souls fell back to when it was decreed they needed to restart the correction process. Okay, so maybe it was 408 souls that ascended to Keter, or 4 x 102, the numerical value of emunah (faith). And maybe that makes sense since 408 = 407 + 1 (Moses) and the square root of 407 = 20.17424, considering that 424 is the value of Mashiach Ben David and 2017 CE is the year 5777. But considering 620 is the value of Keter and there were 620 letters in the 10 Commandments, why not 620 souls? Why not? We do know though that 620-408 = 202, as in verse 20:2 where the 10 Commandments and the 22,000-letters began. Perhaps this had something to do with it. Who knows? And since everything to do with the special set of 22,000 letters, the embedded gift within the Bible, has to do with 10 and the power of 10, perhaps it has something to do with 408 x 6 being equal to 2448 and also that the square root of ((600,000 – 408) x 10 ) also equals 2448 . Let’s not forget that it was the year 2448 when the 2nd Tree-of-life opportunity, the 10 Commandments, occurred, and that that is 66.6 jubilee years before 5778. Could it be for that reason that the Hebrew letters break down into 50 component letters, representing the Jubilee period, and that because of this they form the 600,000 – 408 equations. After all, G-d was pretty emphatic that we count the Jubilee years. To be continued shortly with Part IX. The previous installments of The Ten Commandments are here. Author Jeffrey MeilikenPosted on March 3, 2011 Categories RevelationsTags 10 commandments, 2017, 2018, 2018 ce, 2448, 407, 408, 424, 50, 516, 5778, 600000, 620, 66.6, 666, 6th millenium, binah, end of days, erev rav, final redemption, geula, jubille year, keter, Mashiach Ben david, moses, Moshiach, Sabbath, the people, tree-of-life1 Comment on The Ten Commandments Part VIII: 666, the Most Feared Number? Ten Commandments VI; Making Sense of The Torah’s Mixed Up Time Line. Our last blog was about the split that happened at “The 10 Utterances,” which we showed beyond doubt to connect to Creation, the Torah’s first verse, the Torah in its entirety, to the tree-of-life, to the 42-Letter Name, and to Moshiach. When we last left the Israelites at the 10 Utterances (Commandments), they were at keter, the highest point of ascension possible. They were immersed in the 620 letters and the 62 Yuds (Y) of the 10 Utterances found at the 20th chapter in Exodus with the number 20, esrim, having a gematria value of 620, that same as Keter, the “crown”. And while the letter yud (Y) has the value 10, and can substitute for the 10 in the 10 utterances, when it’s spelled out, (Y-V-D), it has the value 20, esrim and thus Keter again. The ascending Israelites were past the aspect of G-d called Elohim, which was reflected in the 62 Elohims present in the Torah through the 10 generations of Adam. They were in the letter yud (Y) of the Tetragrammaton (YHVH) and ready to enter the tip of the Yud, which we know from the Arizal is Keter, the dimension where the self is reduced to virtually nothing and where we rejoin G-d in the whole, the oneness. In terms of the Torah organization, the Israelites and the event of the offering of the 10 Commandments were at chapter 20 in parsha Yitro of Shmot, paragraphs 54-62. Yitro (YTRV), Moses’ father-in-law, has the value 616, the same as H’Torah (the Torah), which when added to the kolel of its 4 letters gives us 616 +4 = 620, Keter once again, the crowning, highest sefira (dimension). And 54, once again and as explained in the previous articles connects us to the year 5778, when the tzaddikim have advised us Mashiach and the geula (final redemption) will come again, 66.6 jubilee years after the giving of the 10 Commandments in 2448 HC. So what do we mean by come again? And what happened, seeing as they were already at such a high place 66.6 jubilee (3330) years ago? The second question almost answers the first, but we’ll give the full answer after we straighten out the seemingly incongruoustime-line of the 5 portions, Yitro, Mishpatim, Terumah, Tetzaveh, and Ki Thisa; from Exodus 20 – 34, encompassing paragraphs 54 to 130, from the 10 Utterances to the second set of Tablets. Just to put that into perspective, that span of the 5 portions with 22 letters in their combined names is exactly 22,000 letters, 5788 words, 441 verses, 77 paragraphs and 15 chapters long. And while, yes, the fact that 5788 = 5778 + 10 (Commandments); and that 441 is the gematria of Emet, truth, a synonym for Torah, the Tree-of-life and the 42-letter Name; and that 22,000 letters is exactly the number of letters in the Hebrew alphabet, 22 x 10,000; and that 77 is the numerical value of mazal wedged into the middle of 5778, are all compelling reasons to assume this section of 15 chapters is very special, there are other reasons as well. For instance, the total gematria of those 22,000 letters is 1733324 or 299.99 x 5778, off by a minuscule (0.0044%) percent from exactly 300 x 5778, and moreover, when we divide 1733324 by 26, the Tetragrammaton (YHVH) we get 1733324/26 = 66666.308. Now, all that is certainly astonishing, and awe-inspiring in its precision and in the detailed planning that went into specifically organizing these specific 5 portions so that their combined encoding and energy dictates their profound interaction. First, the 42-letter Name is prescribed here by it small gematria value of 173. Next the year 5778 prophesied by the tzaddikim for the arrival of the Moshiach (Messiah) and the geula (final redemption) is hinted several times, including by the starting letter of the 10 Commandments, # 107007 in the Torah (note 54 x 107 = 5778). Then the number 666 so prominent in the calculation of 5778, etc is prescribed. And finally the 22 letters of the alef-bet; and the value of the Tetragramamton (YHVH), 26, is utilized as well. Nevertheless, the Torah goes even further to strengthen this connection for us. In analyzing the 22,000 letters, we see that many of them reoccur very specific and significant number of times. Now, it would be natural for one of them to, even for two of them, but of the 22 letters, at least 7 of them do: the letter bet (B) reoccurs 1024, the number of different word values in the entire Torah, and as we discussed in our last article 1024= 322, the tree-of-life squared; both the letter gimmel (G) and the letter tet (Tt) each reoccur 137 times, as in the numerical value of Kabbalah, meaning “to receive” and “parallel,” and as in the age of the universe, 13.7 billion years; and the letter zayin (Tz) reoccurs 204 times, as in the value of tzaddik; and the letter chet (Ch) reoccurs 616 times as in H’Torah, and as in the number of times Moses exact name (MShH) is mentioned in the Torah, and also as in the numerical value of Yitro(YTRV), the first of the 5 portions; and while Pe(P) reoccurs 358 times, as in the value of Mashiach, the final letter Pe sofit reoccurs 42 times; and the letter Ayin (A) reoccurs 954 times, as in digit #954 in Pi where we find the final of the three 5778‘s (please see There’s Nothing Random in the Universe for an explanation as to why this is significant for us). It’s obvious that in these 5 portions, where we’re receiving the 10 Commandments, the 2 tablets twice, the laws of reincarnation (in Mishpatim), the instructions for building the Tabernacle, the Temple accouterments, and the vestments of the Cohenim, that they all have a reason for us to study them beyond the obvious. But to do that, we must untangle them first, especially the timing of the events, including when and to who G-d is speaking. Another letter, the 8th to have significance for us (this time only in this context) is the letter hey( H) of numerical value 5, found 2060 times within the 22000 letters of the 5 portions. In the middle of the first of those portions, in the 5th verse of the 10 Utterances, at Exodus 20:6, G-d advises that his love will go to those deserved for thousands of generations (eternity/immortality), but the sins of the fathers will pass on for 3 or 4 generations. Here is where the choice was officially offered. The choice given to the Israelites was the same as that given to Adam 2448 years earlier: to choose between the immortality of the Tree-of-life reality, or the cycle of reincarnation, the cause and effect relationship of the tree of knowledge of good and evil. Adam through Eve was persuaded by the snake to choose wrong. The Israelites were persuaded by the erev rav (mixed multitude) to choose wrong as well. This is not surprising as the gematria value of erev rav (ARB RB) is 474, the same as Da’at, knowledge, and that of Snake (NChSh) is the same as Mashiach, so it’s easy to see how they were tricked. This is also why there are legends that say that many of us will be tricked in these days as well. It didn’t take much to persuade them. You know that from your own experiences. A little deceit, a little temptation, rationalization, and bam, we’ve fallen yet again, daily for most of us. But Adam, Eve, the Israelites, they had the miracles right there in front of them, direct from the source, no misunderstandings. And they fell just as quickly as we do, only they fell from the top of the mountain, and we’re still at base camp. In their own words they chose death. G-d let it be Pharaoh’s words that brought about the death of the first born, and the people back then chose their fate with their own words as well. This is why chazal warned us to always choose our words wisely and use them sparingly. According to the Zohar, the words in Moses’ mouth were like a sword, especially when he recited the Shem Mem-Bet (42-Letter Name). They are like swords in our mouths as well, double-edged ones. It’s designed that way as part of the knowledge of Good and Evil, whereby we are our own judges. What comes out of our lips comes right back at us from another direction, as if time and space were warped (just as they are in the spiritual realm. And this is exactly why the Torah warns us to love our neighbors as ourselves. That was it. In Exodus 20:18, G-d fulfilled his promise with Moses that he made with Abraham in 2018. This is the last verse of paragraph 64, the numerical value of Din (DYN), judgment. Now we wait until 2018 ce. From here on out G-d is speaking only to Moses, until in Exodus 24:1 G-d tells Moses go up to G-d and to bring the 70 elders, Aaron–the only names in the Torah associated with the word Moshiach–and his sons Nadav and Avihu, who we know from the Zohar and the Arizal would reincarnate into Pinchas and then into Eliyahu Hanavi (Elijah the Prophet), who we are told by chazal will usher in the arrival of H’Mashiach. Still, they were instructed to bow down and keep their distance. Then after Moses, Aaron, his two sons and the 70 elders made the Covenant of sacrifices they received a vision, at which point in Exodus 24:12 G-d summons Moses up to the Mountain to give him the stone tablets. 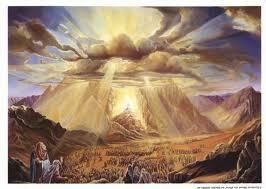 After six days, G-d called to Moses from the midst of the Cloud on the seventh day. In Exodus 24:17, we learned Moses was to remain on the Mountain 40 days and 40 nights. G-d continues giving Moses instructions for 7 chapters up to the Sabbath instruction in paragraph 123, Exodus 31:12, and then in paragraph 124, Exodus 31:18, G-d gives Moses the 2 Tablets of the Testimony, written by G-d. 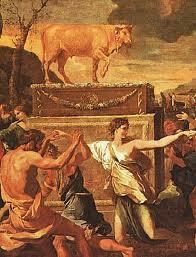 Meanwhile, in Exodus chapter 32, we learn of the Golden calf (H’AGL), whose numerical value is 108 or 2 x 54. And in 32:19 Moses destroys the 2 Tablets that G-d had given him. Then in Exodus 33:23, G-d grants Moses a vision of his presence (ET EChRY) of numerical value 620, that of Keter. This occurs just before G-d gives Moses instructions to carve out the second set of tablets–the first ones were G-d’s creation–and to climb Mt Sinai in Exodus 34:1 in paragraph 130, which happens to be the gematria value of Sinai. In Exodus 34:6, G-d pronounces the 13 attributes and we are again told that his love will go to those deserved for thousands of generations (eternity/immortality), but the sins of the fathers will pass on for 3 or 4 generations. And in Exodus 34:10 G-d advises that He will make a Covenant before all Moses’ people. G-d once again dictated the laws to Moses and asked him to write them down, and once again Moses stayed with G-d for 40 days and 40 nights, then G-d wrote the words of the Covenant, the 10 Utterances on the two tablets. And Moses brought them to his people, his skin now luminous, his being from another dimension. Two (2) is primordially indicative of a split, a dichotomy, divergent and juxtaposed choices. So why 2 Tablets; why 2 sets of Tablets, why going back up 2 times, each time for 40 days and 40 nights; and why were there 2 visions; and why does G-d tell us 2 times that He will be with those deserved for thousands of generations and that those not, will have self-inflicted punishment (rectification) for 3 or 4 generations. And if Moses wrote down ALL of G-d’s words in Exodus 24:4, why did he have to write them down again later, twice (or 2 times). And finally, the Golden calf incident, which ruined everything, happened in paragraph 124, which is 2 x 62, the chapter we were at in the 10 Commandments, when we were at Keter, 62 verses earlier. It is because we’re witnessing 2 parallel universes that existed simultaneously until the 22,000-letter section ends at chapter 34, the 84th in the Torah. As we know, 84, is the number that represents redemption (PD) and the fusion of the upper and lover 42-Letter Names. It’s at chapter 34 that we official fall down from Keter and fall back down to earth/malchut, and begin anew the process of rectifying the shattered vessels of the second (2nd) world, the world of tikun (karma), a process that necessarily has to take 5778 years, as hinted at by the 5788 verses, which included the Yud of simple value 10 for the 10 Utterances. 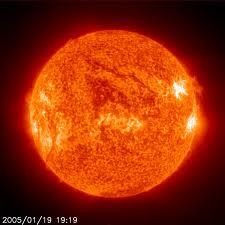 This Yud is the separate universe given to Moses and the few that kept their doubts in check. This addition 10 is equivalent to .1730% of 5778, as in the 173 keys given to Moses and the small gematria of the 42-Letter Name. Moses had just received the vision of G-d’s Presence and was now in keter, and couldn’t be with the people any longer, still it would take another 40 years before they realized he was no longer there. He had ascended, as had everyone else who had been ready. How many? We don’t know, but it may be hinted at in the number of component letters in the Torah, which is 600,000-408 since we known from chazal that there are supposed to be 600,000 letters in the Torah and that there were 600,000 Israelites at Mt Sinai and furthermore that each of the Isralites souls have a letter in the Torah. That would seem to leave 408 Souls that have ascended to keter, or at least missing. The first set of Tablets represented the world of Tohu v’Bohu, the first set of 10 Sefirot (dimensions) whose vessels overloaded and shattered because of a lack of interconnectedness. When the Israelites led by the erev rav feared, rather than embraced G-d’s words, their vessels could no longer hold the light and G-d had to destroy them, which is why Moses had to shatter the 10 Commandments on the 2 Tablets. And if we ask how could Moses destroy G-d’s work, the answers lies in that the spiritual realms to which the Israelites and the Tablets were anchored had already been shattered; otherwise, Moses could have thrown them from the top of the mountain and they never would have broken. But, G-d did make Moses responsible; G-d referred to them as the Tablets that you (Moses) broke. Moses chose to bring the erev rav with him and the consequences would last 66.6 jubilee years, many many generations (28 to be exact). The lesson here is that regardless of our closeness to G-d, regardless of G-d’s overall plans for us, and regardless of His immediate intentions for us, we are responsible for our actions. Author Jeffrey MeilikenPosted on February 19, 2011 Categories RevelationsTags 10 commandments, 10 sefirot, 107, 130, 173, 2018, 2018 ce, 22 letters, 26, 3330 years, 42-letter name, 430, 441, 45, 54, 5778, 616, 620, 666, 70 elders, Adam, emet, erev rav, Eve, gematria, geula. final redemption, keter, Mashiach, moses, Sinai, Torah, truth, YHVH1 Comment on Ten Commandments VI; Making Sense of The Torah’s Mixed Up Time Line. Silence is more than Golden; It Can Be Everything. Years back, I was the announcer at our shul for HaRav, whether we barely had a minion, or had our typical 300 people for Shabbat, or a 1000 for a Shabbaton. What this meant was that I was responsible for making sure everyone understood what was going on, were aware of the unifications and encoding of the prayers as the chazan made them and that they could follow along in the proper consciousness, including leading them through certain meditations. One day I asked the Rav if there was anything I could do for him and he replied simply that I could keep everyone quite for him during the Amidah, the silent standing prayer. You see, the problem was that most people finished their standing prayers–the highest point in our very long morning connections–in a few minutes, and the Rav would routinely take 20 minutes or more. It was obvious the Rav was praying at a much higher level than any of us could fathom, and to those of us with vision, he would even vanish entirely at points in the prayers. Nevertheless, people being people, they would get restless and mundane conversations would break out everywhere, whispered and otherwise. The Rav’s message to me was also obvious on a literal level: that he was making important connections and unifications for the congregation and the world and that we were distracting him. But studying the writings of the Arizal last night, I realized there was a deeper message. Moses is telling the Israelites and erev rav (mixed multitudes) accompanying him that in order to let G-d do his work (which Moses was channeling) they had to remain silent, in fact, that was all they had to do. They weren’t asked to unify themselves, to chant or meditate the Shem Mem-Bet (42-Letter Name) or the Ayin Bet Shimot (72 Names) in unison–Moses and his staff, which was engraved with both those Names) took care of that; all they had to do was silence their mouths and minds. The spiritual process and unifications happen at a very high level and our speech and most of our thoughts occur at the lowest level (malchut) so all we do is weigh down G-d’s work and intentions and surround them with klippot (hard shells of negativity), regardless of our good intentions. So if we want G-d in our lives, we need to be silent and realize that He does know best and is fighting for us. When we speak our minds, we’re just fighting back. Now this verse is important for another reason. The first 3 words (YHVH YLChM LCM) form a key (YYL or YLY)that unlocks the 72 Names that follow in a few verses and are comprised of the proper assembly of the 3 consecutive verse of 72 letters each. It’s also the key that unlocks the alternative special 72 Names, but more about that in a later article. But while we’re on the 72 Names, note that it is in a matrix format and that only two of the Names have letters with consecutive triple tagin (crowns). They are found at column 5, row 7; and column 7, row 8, so like the 42-Letter Name, the 72 Names also contains the hidden date prophesied for the final redemption (geula), 5778 (2018 CE), as explained by Rav Yedhuda Halevi Ashlag (Hasulam) of blessed memory. 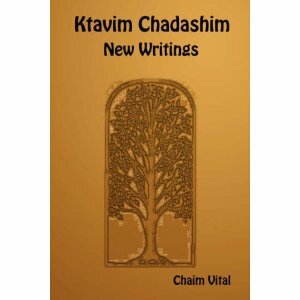 Nevertheless, Rabbi Chaim Vital of blessed memory in his book New Writings (Ktvim Chadashim) cautions against utilizing the 72 Names, and understanding what his teacher, the Arizal, was highlighting in examining the verse Exodus 14:14, we can see how best to utilize them: In silence. 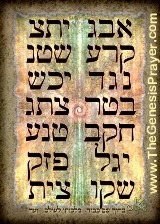 We do no harm in connecting to the 72 Name Matrix if we silence our mouths and minds and let G-d do the work for us. So rather than stare at the Names and tell them, or the universe, what we want to happen, or G-d forbid try to recite them, we should simply silence ourselves, let go, and let G-d to what’s best for us. Anything else, is pure ego, and nothing good can come of that. In other words, we must make room for G-d in our lives, thoughts, and especially in our meditations. And as the Rav asked of me, and Moses asked of the Israelites at the Sea of Reeds, we must make room for Moshiach (the Messiah) in our lives as well. Moses comes to us in every generation, and as Moshiach in this one, and we have know enough to step out of the way and allow him to split the seas for us, for that is the only way to reach the Tree-of-life on the other side. And beware of those that will try to interfere. Ask yourself this, if the plague killed all the Egyptian livestock and animals, where did Pharaoh get the 1200 horses and 600 mules for his 600 choice chariots? And the rest of the mules and horse for his other chariots? We’ll give you the answer in out next post, but you already know it inside of you. Author Jeffrey MeilikenPosted on January 15, 2011 Categories Kabbalah Secrets, RevelationsTags 2018, 2018 ce, 5778, 72 Names, 72 triplets, ashlag, erev rav, Rav Ashlag, Rav Berg, sea of reeds2 Comments on Silence is more than Golden; It Can Be Everything. The Calendar is for Everyone; The Tree-of-Life will be Open to All. Many of you will be celebrating an event and lifetime that occurred on Dec 25th 2000 years ago. Many of you won’t. Many of us celebrated the 25th of Kislev and did our part to bring the light of Moshiach, the messiah, into the world. All of us, though, are the Sons of Adam. 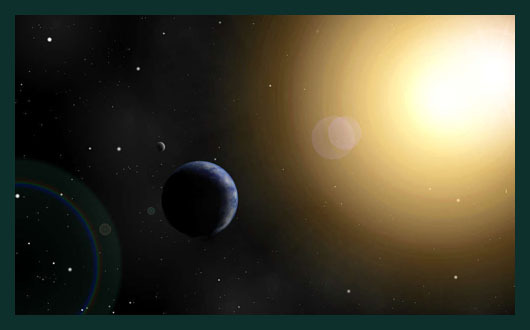 When the Earth completes 5778 revolutions around the Sun from the birth of Adam, matching its surface temperature of 5778 K degrees the gates to the Tree-of-Life reality will open. Some of you have asked kabbalistically why the numbers 5778 and the 107 are connected. It’s indisputable in our base 10 mathematics and our 10 dimensional greater universe that the sum of all the positive integers through 107 = 5778, and that that pattern of summing the integers is important to the structure and composition of the Torah, but what’s the underlying spiritual premise? Yes, we know the spiritual law that nothing is ever lost and that all energy builds on itself and thus one number gets added to another, but what’s the connection to our lives? We are all the Sons of Adam. That specific term in Hebrew is Benei Adam (BNY EDM). Counting from Adam, when the Earth completes its 5778th revolution around the Sun, the Sons of Adam (BNY EDM), of numerical value 107, will be able to open the gates the Tree-of-life reality, the world beyond Illusion. All the energy of all the generations will be there. It’ll be the year 5778 HC (2018 CE) and if you do the math, exactly 54 generations will have passed. That works out to 91 years (equivalent to the unified Name of G-d, YEHDVNHY) each for the 26 (YHVH) generations to Moses, implying the lineage from Adam to Moses was one with G-d. Them there were 120 years each for every one since, which may be why the Torah told us Moses lived 120 years and the Zohar told us Moses lived in every generation since. Remember, these are Moses’ generations, bases on his lifespan, not ours. We can’t blame G-d that we didn’t eat healthy enough, live healthy enough, or take good enough care of our environment. The Sons of Israel are those whose souls descended from Jacob and who the Torah numbers as 600,000. The “Sons of Israel” in Hebrew is Benai Israel (BNY YShREL) of numerical value 603, or 611 with the kolel for the 8 letters. 611 is the gematria of “Torah” for those who possess the souls of sons of Israel are the followers of the Torah. There is a 3rd group, the Erev Rav, who will try and interrupt the opening of the gates in 5778, but more of them in another article. As for the Sons of Adam (BNY EDM), you may have noticed that their journey, like all Torah journeys is defined by their first and last letters (MB), or 42, as in the 42-Letter Name of G-d. Moreover, what’s left is NYED, which does not stand for New York Dept of Education, but does permute to EDNY, Adonai, who is the One who guides their journey. Now you know the secret of 107 (MB and EDNY). And since spiritually every number is inclusive of all that came before it, the Letter Yud is equivalent to 1+2+3..10, or 55, likewise the letter Hey (15), Vav (21), and H (15), again with the kolel for G-d is One (1). Thus YHVH = (55 +15 +21 +15) + 1 = 107. As Earth completes its 5778 revolution journey, doing its part in spite of us, and as the Sun burns bright at exactly 5778 K doing its part to sustain us, in spite of ourselves, ask yourself what you are doing to help your soul complete its 42 part, 5778 year journey in time to receive the Tree-of-life reality in 5778 (2018 ce). Are we doing our part? 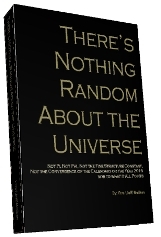 Author Jeffrey MeilikenPosted on December 23, 2010 Categories RevelationsTags 107, 120, 120 years, 26, 42, 42-letter name, 5778, 5778 K, 600000, 91, Adam, Calendar, erev rav, gematria, integers, Israel, Jacob, moses, sons of adam, sons of Israel, Sun, Torah, tree-of-life, YHVH3 Comments on The Calendar is for Everyone; The Tree-of-Life will be Open to All.